Same proven pheromone formula as its bottled predecessor, the Alter Ego Pheromone gel packs for Women are easy to carry and apply, non-oily, and an inexpensive way to try a new product out before investing in a bottle of Alter Ego Pheromones for Women. 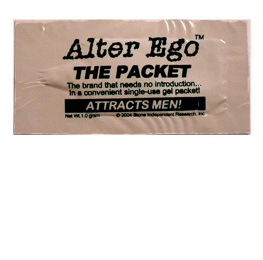 NOTE: Alter Ego Pheromone gel packets are 33% smaller than previously in an effort to get closer to a 1 use packet. Probably most will find them good for 1 1/2 uses, or one solid use and a refresher. Reports on the previous Alter Ego Pheromone gel packets had them running 2 to 2 1/2 uses. Sometimes using human pheromone products in public can be less than convenient, and that’s where pheromones gel packs and wipes come in. These easy to carry and easy to use pheromones come in small discreet packs are the perfect option for charmers and seductresses on the go. Use the pheromones before you head out, apply it on the go or bring a gel packet with you to freshen up as the day/night wears on. We currently carry some of the biggest names in Pheromone products, including Chikara, Edge, and Alter Ego products. If you’re looking for something in a larger size, we also offer some of the best pheromones for women and men available. Take a look at our selection – they are a great way to introduce yourself to the power of pheromones. Scientists are making great strides in research of the effect of pheromones in humans, and we are proud to be a leading supplier of some of the best and most advanced pheromones in the world. We’re so confident in the quality of our pheromones that we offer a 100% money-back guarantee on all products, so don’t wait – try our pheromones today and go have some fun!